The Dangers of This Hot Trend. You would have to be living in a cave to miss that make up, video tutorials, and contouring are all the rage. The hyper-contoured look, made popular by Kim Kardashian, has even young teen girls glued to their Instagram & YouTube accounts. While it is interesting to see the before and after's, I was wondering if all of the make up that is being placed on skin these days is good for it? Are people hurting their skin by trying to achieve the perfect chiseled contour? 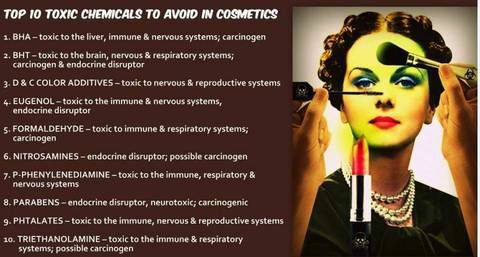 Let's face it (pun intended) The make up we use can be laden with harmful chemicals that is damaging our skin. Over-contouring is a sure way to guarantee you’re using heavy makeup that is probably failing to let your skin breathe. Applying heavy makeup daily can lead to skin conditions, allergic reactions and illnesses you may not be aware of. The Huffington Post, stated that the US has banned 9 carcinogens and the EU has banned 1000 of them. What's a carcinogens you ask? It's any substance that can directly cause cancer. So are we literally killing ourselves to look good? Products such as foundation, concealer, blush, and bronzer are staples of contouring are known to have harmful chemicals in them. Petrolatum, PEG compounds, formaldehyde-releasing preservatives, DEA-related ingredients, and sadly so many more are called "The Dirty Dozen" and are likely in your make up drawer. Preservative chemicals are put in make up to make sure it lasts on the shelves and those chemicals can penetrate the skin. Watching any make up tutorial, you see layer upon layer of make up being applied and it is all seeping into your skin. Part 2- Is Your Make Up Causing your Skin to React, Causing You To Buy More Make Up?